The regime has unleashed a wave of repression that it can no longer control. 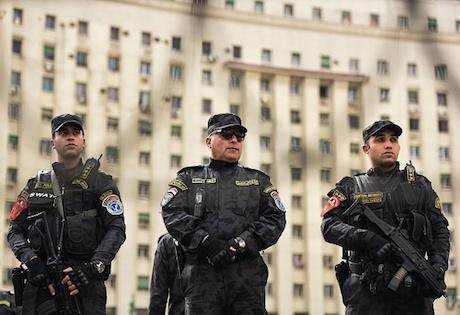 Power now lies in the hands of those that police local communities: Egypt’s new untouchables, the petty security officials. Mohamed El-Shahed/AFP/Getty Images. All rights reserved.Over the past few months, news of repression coming out of Egypt has witnessed a qualitative shift: it has been worsening. First, there was the murder of the Italian PhD scholar, Giulio Regeni, who was conducting field research on independent trade unions in Egypt. His battered body was found dumped on the outskirts of Cairo, showing signs of “inhuman, animal like” violence. Even though there is no hard evidence, accusations have been pointing at the Egyptian police, who had supposedly apprehended Regeni shortly before his death. This was followed by the murder of a tuk-tuk driver by an ameen shorta, a lower-ranking police official, over an argument about the fare in the lower-class area of Al Darb Al Ahmar. The driver was shot in the head then and there, which prompted the crowds to attack the ameen shorta and march in angry protest to surround the police station. This was followed by similar attacks on doctors in Matareya Hospital by the same rank of police officials. This was due to the doctors' refusal to forge a medical report. This event triggered a partial doctor’s strike in protest, and it is the first incident where a professional syndicate – previously dominated by the Muslim Brotherhood – takes an open position against Egypt’s current military regime. This series of events was reflected in popular discourse with the appearance of the phrase “mafeesh Hatem beyethakem”, to mean “no ameen shorta (policeman) stands trial”, reflecting the impunity with which these petty security officials operate, which is indicative of the state of the Egyptian polity. This qualitative shift in repression can be attributed to three factors: the worsening political and economic situation of the country; the decentralization of repression; and the change in the ministry of interior’s role under Sisi. All of these factors are interlinked and mutually reinforcing. Egypt has been experiencing a severe economic crisis that has intensified over the past few months. It is clearly reflected in the rapid devaluation of the Egyptian pound and the shortage in the supply of hard currency, which is creating major issues for industry. This can be attributed to the collapse of revenues in several vital sectors. First, the collapse of the tourism industry after the attack that downed the Russian air jet killing over 200 Russian tourists. Many hotels in the Red Sea are reporting minimal occupancy rates, with some of them even closing down as they can no longer bear the operating costs. This dried up Egypt’s most important source of foreign currency. Second, the reduction in revenues from the Suez Canal, which was recently expanded at a cost of eight billion dollars; a project mainly executed by the military. The lower price of oil has been causing ships to by-pass the canal, going around the cape of Good Hope at higher speeds and lower costs. Besides the apparent loss of eight billion dollars, if this trend continues the revenues from the Canal are only set to decrease further. Finally: the reduction of remittances from Egyptians abroad. This provided a steady stream of hard currency, but it decreased with the collapse of the price of oil because a large number of Egyptian workers are concentrated in the oil producing Gulf. This created a crisis in which the Egyptian pound has been subject to a series of devaluations, and the dollar has been in short supply. The regime has unleashed a wave of repression that it can no longer control. The crisis is so strong that some manufacturing companies have suspended their operations, due to the lack of hard currency. This will also drive up inflation, since Egypt imports many basic foodstuffs (Egypt is the largest wheat importer in the world), which will hit the lower and middle classes very hard. The pinch is even being felt by the upper classes, as the currency crisis is starting to affect their luxurious consumer habits. In the midst of this crisis, Sisi’s motorcade is seen driving over a four-kilometre-long red carpet that is reported to cost over a million pounds, while at the same time indicating the government’s intention to remove subsides for drinking water. This sense of crisis was reflected in the latest and longest speech given by Sisi, when he announced his development plan for 2030. In a scene reminiscent of the Arab dictators' ‘king of comedy’, Colonel Gaddafi, when he asked his detractors “who are you,” Sisi asked the people of Egypt to “listen only to me” and then offered to sell himself to raise money for the country. An activist responded by placing him for sale on eBay under the title of “slightly used dictator”; the page has now been removed. This economic crisis has repercussions on the level and nature of repression experienced by the Egyptian polity. As the failures of the regime become more apparent, the promises of prosperity are evaporating and its popularity is eroding. The regime is starting to rely more and more on repression, ceding more power to the petty agents of this repression as they commit the regime’s crimes. Thus, a process of the decentralisation of repression is taking place, where the petty agents of repression are given the green light to act as they see fit. Repression is no longer being directed from the center, on the contrary, it is being directed from the periphery as power is becoming diffused. This makes the repression random and unpredictable, lacking its own coherent logic. Previous 'red lines', as under the Mubarak regime, are disappearing and not being replaced. The clearest example is the murder of Regeni, a European citizen. This would have been inconceivable under the Mubarak regime, especially since he could have easily been deported. The decentralisation of power also allows petty security officials increased powers in policing their own local communities, as they become the eyes and ears of the regime. Thus, the regime overlooks cases of corruption and extortion, where these security officials turn their local communities into fiefdoms. In some cases, their power is more pervasive than senior officers who have no connection to local communities, as they rotate from one station to the other. Accordingly, the use of excess force by petty security officials should not come as a surprise. They have become accustomed to violence and repression as daily tools to deal with local citizens. As the regime relies increasingly on repression, the power of the interior ministry – as the coercion apparatus mainly responsible for internal repression – also increases. As such, the regime becomes less likely to attempt to rein in these petty security officials as they are on the front lines carrying out the acts of repression. The Egyptian polity is currently stuck in a reinforcing loop of militarisation and repression, which seems to be set to increase over the coming years. Some might have hoped, including myself, that the first wave of repression would subside, allowing for the re-establishment of a logical pattern of repression that citizens can navigate through. However, this has not occurred. Repression is now more random and illogical, and thus more dangerous than it was before. This is exemplified in the phenomenon of forced disappearances, which has now reached hundreds of cases, with many ordinary citizens disappearing as well as the lawyer who was representing the disappeared.